The Minecraft community seems to have an obsession with doing everything on YouTube. For some people that’s great, but as someone who is already a coder and I just need to know the environment-specific details for coding for Minecraft I have a really hard time sitting through an hour of tutorial videos just to get the four things I needed to know that I didn’t already know how to do. This is where having a text and pictures version of a tutorial comes in handy, so you can skim through it looking for the parts you still need to know, and easily skip over the stuff you already know. Another friend of mine was also recently trying to get into writing a plugin for Spigot, and everything I could find to point him at which was text-based rather than a YouTube video was very outdated, had instructions that were no longer relevant because Bukkit and Spigot and Eclipse have all evolved since then, etc. So I figured I’d write one, and here it is! You need the Java Development Kit, not the Runtime Environment. Download the Java SE JDK from Oracle’s site. Make sure you get the JDK, not the JRE, and make sure you have the correct one for your operating system. Java.com only has JREs, you have to go to Oracle’s site for the JDK. Linux users can try installing the java-8-openjdk package. Note for OS X users: OS X no longer ships Java by default. It will automatically install if you try to run something that needs Java, however, the version it installs is old (Java 6) and Bukkit/Spigot development requires at least Java 7, so you will need to download the newer Java even if you already have the system Java. You need to link against Spigot in order to compile plugins, so you’ll need a local copy of Spigot to link to, even if you never actually run it. This will probably take a while. If all goes well, you should get a file called Spigot-1.11.2.jar in the same directory with BuildTools.jar (the version number in the filename may be different if Spigot has been updated since I posted this). 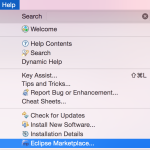 Remember where this directory is, you’ll need it later when creating the project in Eclipse. Plugin development is done with a Java IDE. If you already have a favorite Java IDE, I imagine you can make it work, but if you don’t, I recommend Eclipse, and that’s what my instructions will be based on. Most Linux distributions have Eclipse packaged already and you can probably use your package manager to install it. Your mileage may vary in getting it to work. Personally, I’ve had issues getting Eclipse plugins to work correctly because updating plugins sometimes breaks the way the packager packaged the main app, and sometimes plugins want a newer version of Eclipse (Ubuntu ships an older version), so I use a copy of Eclipse downloaded from eclipse.org rather than the one Ubuntu ships. The file you create that tells Spigot how to interact with your plugin is in YAML format. 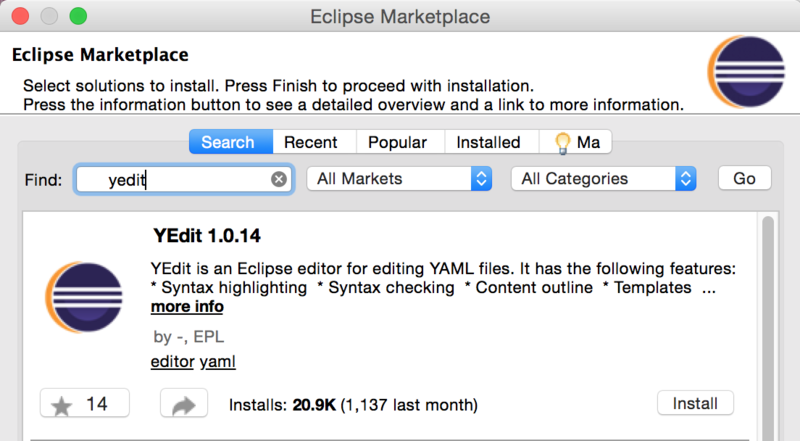 As shipped, Eclipse does not understand how to edit YAML files (even though it’s really just a text file). There is a plugin that will teach it how, though. Go to Help -> Eclipse Marketplace, and type “yedit” into the Find box. The YEdit plugin should be the first hit. Click Install and follow the prompts. In Javadoc location path, enter: https://hub.spigotmc.org/javadocs/spigot/ . This will allow the autocomplete in Eclipse to autocomplete Spigot API objects and methods. Enter the name of your package. This is usually structured like a domain name, but in reverse. It should start with something that identifies you, and then have the name of the project at the end, and be all lower-case. Minecraft itself is net.minecraft.server for example, Spigot is org.spigotmc, and the Bukkit plugin API is org.bukkit.plugin. I’ll use tld.example.myplugin in the examples. Enter the name of the class which will be loaded by Spigot when it loads the plugin. You can really name this anything you want (we’ll deal with telling Spigot how to find it later), but for simplicity I’ll call it Main in the examples. It should open in the editor. If it doesn’t, you likely forgot to install YEdit up at the top of this tutorial. This file will be in YAML format, and describes to Spigot how to interact with the plugin. The top of the file leads off with some basic information about the plugin, and is then followed by a description of the commands which are made available by the plugin. permission-message: You don't have the myplugin.mycommand permission. The “main:” line needs to list the package and class name of the class which is loaded by Spigot when it loads the plugin’s jar file. “version”, “author”, and “description” are human readable, and shown to the user by the /plugins and /help commands. The “commands:” block should contain one line for each command you implement. If it’s not listed here, Spigot won’t send the command to you when users use it. Within each command’s block, the “description” and “usage” sections are shown to the user when they use the /help command. The “permission” line describes which permission grants access to the command. “permission-message” is shown to users who don’t have permission to use it if they try to. The “permission” should start with the name of the plugin, a dot, and then an arbitrary permission name. You can also borrow another plugin’s permission or a core permission. For example, if your plugin adds additional features to MultiWorld you could require “mw.admin” permission or so forth. You can leave out this line if you want it available to all users. To be able to install the plugin into Spigot, you need to create a JAR file (Java ARchive). You can use File -> Export -> Java -> Java JAR to create it, but then you end up having to specify which files to include every time. 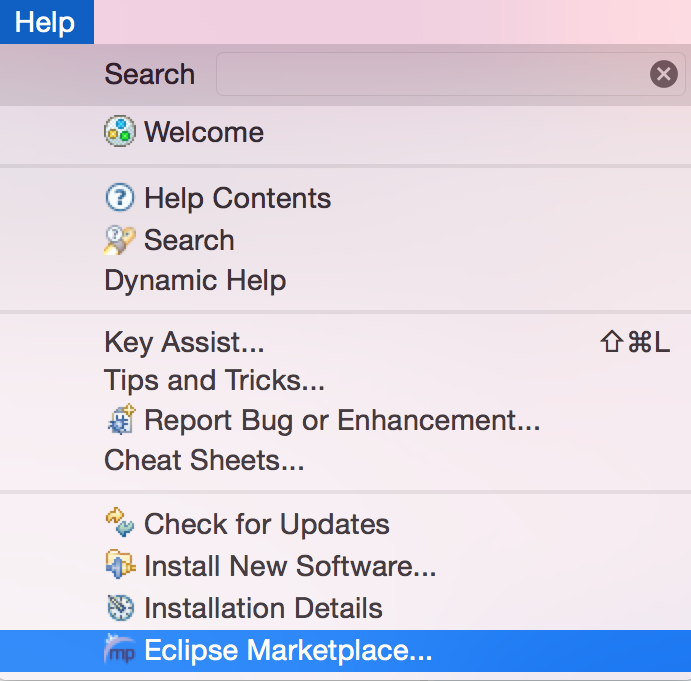 In the long run, it’s easier on you to set up Eclipse to automatically build it. So in this step we’ll be creating a build script that defines the contents of the JAR file so that Eclipse can do that. It should open in the editor. Where it says “MyPlugin” at the top, you’ll want to replace with your project name. Also, WordPress adds a space between the < and the ?xml in the first line because it looks too much like the syntax used to start a php code block. You’ll need to remove that space for the file to be valid. Right-click (control-click or two-finger-click on Mac) on the project name and choose Properties. Choose Builders on the left side. Switch to the Targets tab. Click on Set Targets… next to each of “Auto Build” and “During a ‘clean'” and just click the OK button on the resulting dialog. Click OK to close out of the Edit Configuration window. Click OK to close out of the Properties window. At this point you should have a working project, and any time you make changes to anything in your project, it will automatically rebuild the plugin’s jar file in the target directory. As long as you’ve been saving your changes, it should always be up-to-date with your code. If you’ve followed the above instructions up to this point, you now have a working plugin file which does absolutely nothing, but has all of the necessary framework. UPDATED 2016/05/06: Still works in 1.9, so updated references accordingly. Fixed step 6 in creating the project to use the shaded version of the API file. Thanks to several people in the comments for pointing it out. UPDATED 2017/02/21: I haven’t had a chance to try it myself recently, but multiple people have said in the comments that this still works in 1.11.x, so I’ve updated the references accordingly. This is a great tutorial, I really enjoyed the build script and the fact that you actually install YEdit to edit yml files properly (this is something I also covered in my online course spigotcourse.org). Nevertheless, I find text articles easier when it comes to updating, but in my opinion following a video series is more handy because you get to explain more of the background and can make it more entertaining (people usually skim through text and can miss parts). Thank you for an excellent tutorial. I also prefer text/pictures instead of YouTube-videos for this type of content. I tested this with a 12.2-version of the Spigot-API, and it worked fine.